An original signed and dated (1938?) 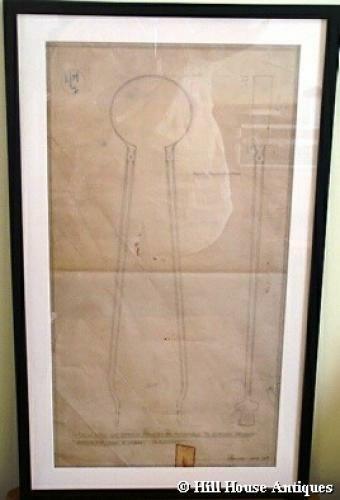 full size pencil drawing on tracing type paper, by Edward Barnsley of a pair of fire tongs that were made by Alfred Bucknell to an Ernest Gimson design. A similar pair of tongs is in the Cheltenham Museum & Art Gallery and illustrated in "Simplicity or Splendour: Objects from the Cheltenham Collections" page 112. Newly framed/backed etc. Approx 15" by 25.5" inc frame.